No need to spend a lot of money on fancy conditioners and hair treatments. The cure for dry hair is in your kitchen cupboard. This simple hair mask consists of three ingredients: coconut oil, honey and apple cider vinegar. Both coconut oil and honey are known for its moisturizing and restorative properties. Coconut oil is wonderful for hair. It improves scalp health, supports hair growth, and adds volume and shine. Honey is a powerful humectant, meaning it draws moisture from the air. This is especially good if your hair is overly dry due to the use of flat irons or blow drying and if you have a dry scalp. 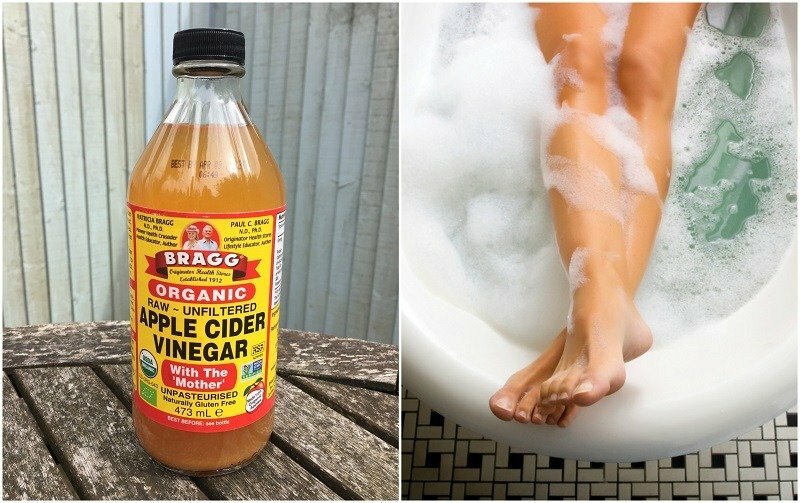 Apple cider vinegar removes residue from the hair, as well as working as a natural detangler. If you are looking for a natural way to soften hair or repair it from styling damage, this coconut oil hair mask is it! These amounts can vary depending how long or thick your hair is. I have very think hair and this amount was more than enough to cover my hair from the roots to the tips. Melt the coconut oil until liquid. Add the honey to the melting coconut oil. If it’s cool in your home, you might try popping the honey in the microwave for a few seconds to warm it up. Next add the apple cider vinegar. Mix the ingredients well. If it separates a little bit, that’s perfectly fine. Just give it a swirl or two as you apply it to make sure you are getting an even amount of each ingredient. I find the best way to apply the mask it use a hair coloring brush or a natural pastry brush. Section your hair into four equal parts, then part your hair in half inch sections. Apply the coconut oil hair mask starting at the roots and move up to the tips of your hair. Once you get a section done, massage your hair with your finger tips to really get it in. Pile your hair into a bun and let it sit for 15-20 minutes, then wash with a mild and natural shampoo. I did not need an additional conditioner. If your hair is very dry, leave the mask on longer. Better yet, wrap your hair in a towel or use a shower cap and leave the mask on for an hour or more, then rinse. Style as usual. The next time your hair seems dull or dry, head to your kitchen cupboards and whip up this easy coconut oil hair mask.